Thursday November 19 1908 This week last year was the last we had Father with us. I got my work done early and brought Mother out. I took her back early in the afternoon. It was such a pleasant day. I had a letter from Lydia full of delight that we were coming. I was busy about the work all evening. 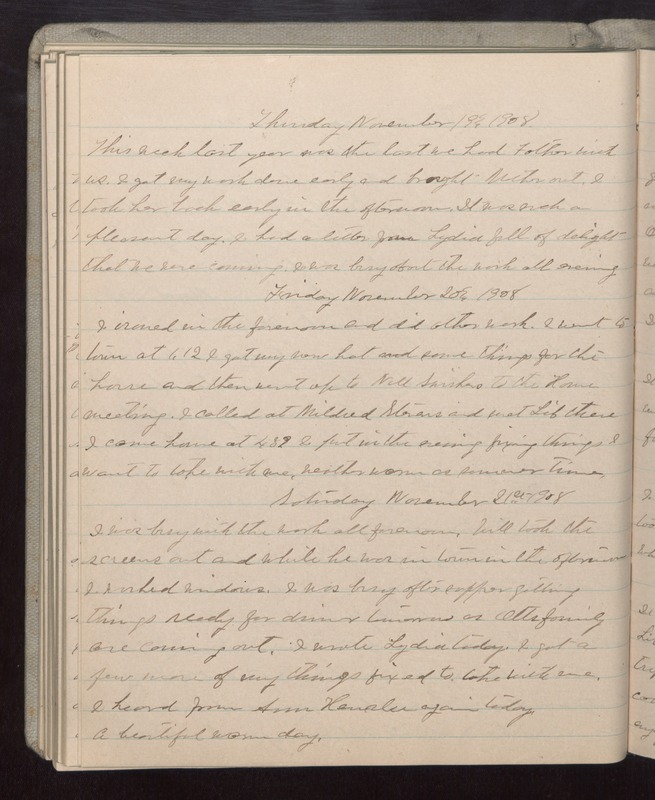 Friday November 20 1908 I ironed in the forenoon and did other work. I went to town at 1.12 I got my new hat and some things for the house and then went up to Nell Swishers to the home meeting. I called at Mildred Stevens and met Lib there I cam home at 4.39 I put in the evening fixing things I want to take with me. Weather warm as summer time. Saturday November 21st 1908 I was busy with the work all forenoon. Will took the screens out and while he was in town in the afternoon I washed windoes. I was busy after supper getting things ready for dinner tomorrow as Otts family are coming out. I wrote Lydia today. I got a few more of my things fixed to take with me. I heard from Ann [Hensler?] again today. A beautiful warm day.